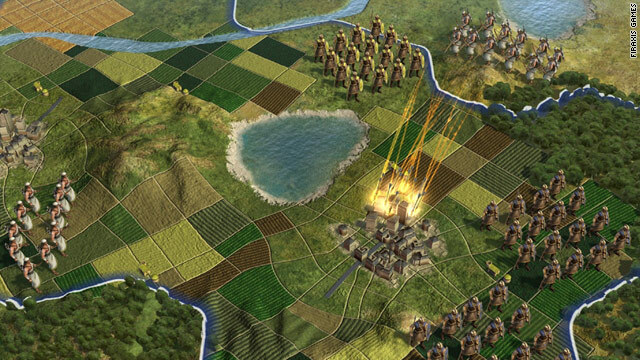 Expect big combat changes, no more "stacks of doom"
(CNN) -- "Civilization V" is the latest incarnation of Sid Meier's successful series of strategy games that allow players to take a tribe of people and try to turn them into the most dominant country in the world. CNN.com got an invitation to the "Civilization" lair at Firaxis Studios near Baltimore, Maryland, to get a look at the elements of the new game and talk with its brain trust about what changes they made and how it will all fit together. When "Sid Meier's Civilization IV" was released in 2005, it swept up several awards, including three for Game of the Year, garnered many perfect and near-perfect scores from reviewers and spawned three expansions over the next three years. While fans of the series continued to play "one more turn" (the classic gamer justification for up-all-night sessions), some asked whether this was the best the game could get -- and whether Firaxis would ever make another installment. "Each new version of 'Civilization' presents exciting challenges for our team," said Meier, co-founder and director of creative development at Firaxis Games. "Thankfully, ideas on how to bring new and fun experiences to 'Civ' players never seem to stop flowing." Designer Jon Shafer said his goal was to not mess with the formula that made other "Civilization" games so successful. Having played the series since "Civilization III" in 2001 and worked on the "Civilization: Beyond the Sword" expansion pack, he had a plan in mind. "I want to add more to it," Shafer said. "We wanted to evaluate the larger parts of the game to see when we could make changes. Combat was a big area." A new combat system, deeper diplomatic experiences, expanded features and rich, dynamic graphics are all part of the new package for "Civilization V," a project 2½ years in the making. 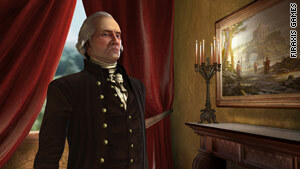 Firaxis spokesman Pete Murray said it was all designed to invite players to get into the game. "We really wanted [the players] to become engaged with it," Murray said. "But we also had to develop a graphics engine so we could be able to get it down for laptops." One of the earliest changes to how "Civilization" was played was to move from a square-based map to a hex-based map. The development team said the change opened new avenues for how the game would look as well as how it could be played. "We wanted to create a believable world," said marketing director Kelley Gilmore. "It looks much more organic and takes the game a step farther from where it used to be." The hexes are overlaid onto a more diverse geographical terrain and rounded coastlines. Featured items on the map completely fill hex spaces but don't bleed over into neighboring areas like they sometimes did with the square overlay. The hexes also change how combat works. With two more sides to each space, two more units can be brought into each battle. Movement also has a more realistic feel and allows for more options. There's been more reworking of the combat system. In the older version, military units could stack, meaning you could have multiple units -- sometimes called "stacks of doom" -- on one square. Strategy usually consisted of moving these huge stacks though enemies, who often had their own "stacks of doom" living in their cities. Murray said the new system will only allow one unit per hex, bringing a new element of tactical combat to the game. "Military units can take gradual damage, which makes them last longer," Murray explained. "It requires players to build a more efficient, modern army." Units that have ranged attacks -- archers, catapults, cannons, artillery -- will be able to attack from distant hexes instead of being required to be next to opposing forces. And garrison forces will help in the defense of cities so that towns won't be outnumbered by surrounding enemies. Artificial-intelligence programmer Ed Beach said that different civilizations will have different strengths and weaknesses but that some tendencies will be randomized by the game's new A.I. "It looks for weaknesses and uses best practices to play the game," Beach said. "There are different levels of strategy and it will pick up on how you play." He said game developers did thousands of A.I. runs to make sure that all civilizations are balanced. But he cautioned that bonuses and location on the game's maps will play a big part in the success of each culture. While technology advancements enabled changes in how the game was played, it also contributed to how the game looks and feels. Lead artist Dorian Newcomb said tech pushes things further from a visual standpoint. "The landscape is based on real world images. We wanted to try and give a helicopter view of the world but romanticize it -- no need to accurately reproduce it," Newcomb said. He said "Wonders," items that represent a significant milestone or bonus to players, also were made to have an epic feel. The action sequences, including scenes of celebration, when Wonders are built are intense and full of cultural references, Newcomb explained. The entire game has been given an art-deco feel. Buttons have a bronze tint, and visual angles in the graphics are from a low perspective that creates a look reminiscent of posters from the New-Deal era. George Washington is ready to listen, but remember, he was a general too. World leaders were also graphically designed to make them feel like real competitors. They speak the language of their people, or as close as developers could get, and the backgrounds behind them are representative of their cultural history. "Game designers are history majors," Newcomb said with a laugh. "We have to know how to draw these characters. The way they look, where they might have held court, everything." Lead animator Chris Hickman said he wanted to make the leaders have distinct personalities so that each one feels different. "George Washington is based on my grandfather, a friendly, open, older gentleman," Hickman said. "Julius Caesar is bored and dismissive when talking with the players." Indeed, during a demo of the Caesar animation, the Roman emperor appears to be distracted and yawns. He ends the conversation with a wave of his hand. "We wanted to try to be respectful, but not necessarily historical" in the representations, Hickman said. "We want it to be a fun experience for the player." The music included in the game continues the idea of keeping a historical feel to the experience. Michael Curran, senior sound designer and composer, said the goal was to achieve a cinematic orchestral style to fit each culture. "In the case of ancient or dead civilizations, we were actually able to find melodies, if only fragments in the case of Augustus Caesar or Ramses II," Curran explained. "With more recent leaders, these melodic sources will be recognizable." Many of the pieces in the game were recorded by the Czech National Symphony Orchestra in Prague, capital of the Czech Republic. In addition to traditional instruments, hundreds of unique ethnic percussion, string, wind and reed instruments were used to achieve each culture's musical feel. Shafer said all the changes are geared toward giving fans of the game the depth and richness they've come to expect from a "Civilization" game, yet still make it simple enough for new players to enjoy and not feel overwhelmed. "Civilization V" is expected to be released September 21 for the PC only.